A vitamin that promotes a healthy liver function and is a factor in the maintenance of good health. Detox-Pro is a unique, simple-to-use,15-day supplement protocol that aids detoxification on two distinct levels. Firstly, it provides critical nutritional support to the body's natural detoxification systems by offering specific, high- powered nutrients that improve liver function and optimize the Phase I through Phase II Detoxification pathways. 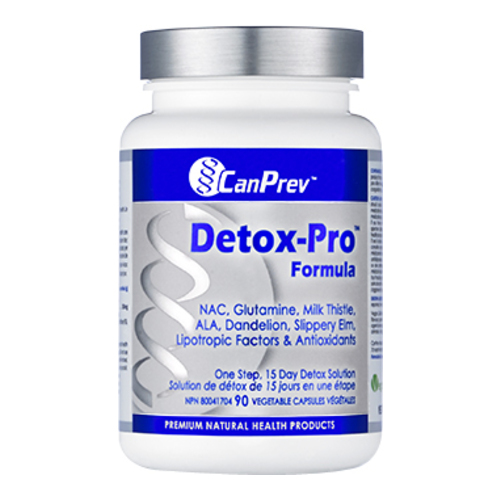 Secondly, Detox-Pro contains a number of medicinal herbs to gently support and stimulate the gallbladder, intestinal tract, and bowel for enhanced toxin elimination. • Take 2 capsules 3 times per day with meals including protein a few hours before or after taking other medications or as directed by a healthcare practitioner. • May be repeated periodically throughout the year. • For optimal effectiveness, take with plenty of fiber and probiotics. Avoid red meat, dairy, gluten, sugar, and alcohol. No other vitamin supplements are required during this time.